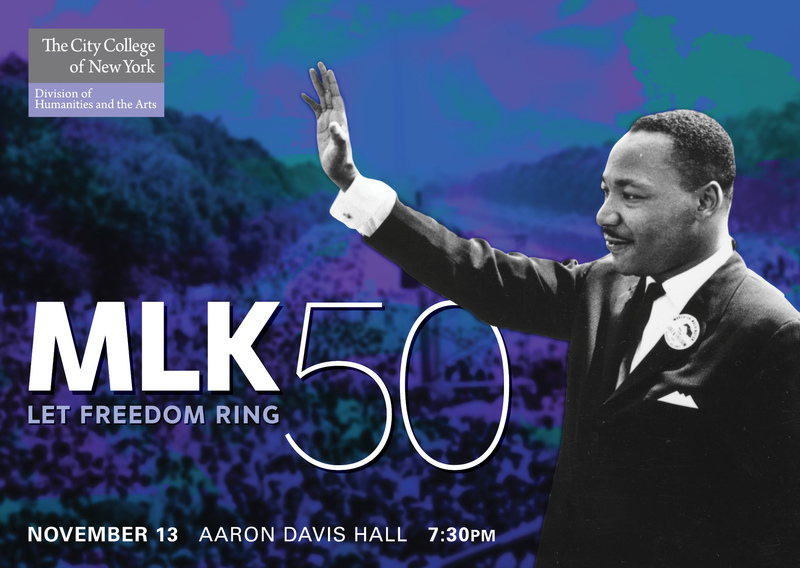 MLK50: Let Freedom Ring is brought to you by CCNY's Division of Humanities and the Arts and will take place on Nov. 13 in Aaron Davis Hall at 7:30 p.m. The City College of New York’s Division of Humanities and the Arts presents MLK50: Let Freedom Ring. The event, Tuesday, Nov. 13, 7:30 – 9 p.m. in the Marian Anderson Theatre of CCNY’s Aaron Davis Hall, commemorates the 50th anniversary of Dr. Martin Luther King Jr.’s assassination in April 1968. Inspired by King’s teachings on dignity, freedom and equality, the commemoration includes remarks by City College President Vince Boudreau and a performance of John Coltrane’s “A Love Supreme” by CCNY’s Faculty Jazz Ensemble featuring professors Suzanne Pittson and Mike Holober. “MLK50: Let Freedom Ring,” is free and open to the public. Please RSVP at City College Center for the Arts, or call 212-650-6900 for more information. CCNY's own personal connection with MLK and his legacy dates more than 50 years ago when he was the Class of 1963 commencement speaker. Later, his widow Coretta Scott King became the first female commencement speaker in CCNY history when she addressed the Class of 1971.